One of the most common questions that vintage watch collectors ask is: when was my watch made? Sometimes this question can be answered immediately and sometimes it takes a bit more work. In this post, I’ll focus on 16 types of clues that can help you to date your watch. The first thing to check are serial number charts. Sometimes they’re official resources. Sometimes they’re compiled by brand aficionados, who attempt to combine all the bits of knowledge into one resource. Serial number charts are only available for a handful of manufacturers though. Usually for the ones that kept accurate records. That would be Omega, Longines, Rolex, Zenith, etc. If there are official resources, they usually make their way into the Internet and aren’t hard to look up. High-end brands like Patek Philippe or Vacheron Constantin kept (and still keep) excellent records. So, their serial numbers are also available. Keep in mind, that it’s important to research the system of production markings specific to a brand. For example, Doxa used separate serial number systems for solid gold cases. Omega serial numbers are different for Speedmasters. Zenith changed their serial number system circa 1962. Before that, they had a separate system for watches made at their French factory in Besancon. So, always make sure that you’re matching the serial number with the right resource. In case of many serial number resources for a brand, check the serial with all of them. The documentation of some brands is good enough to come up with a rough date of manufacture. That’s because production years of a specific model are known. Heuer is a good example. OnTheDash has entire lists of various models, with production years given. Omega kept archives that are accurate enough to date their watches by serial numbers. But you can also look up the reference numbers in the Omega Vintage Database. You can check if the case, movement, and dial are a match if you have a reference number. Even if you know the movement serial. Obviously, not all of their watches are listed in there but unfortunately, that’s as good as it gets. Some brands, like Bulova, used simple means of marking the date of manufacture. Bulova used a letter to mark the decade, a number from 0 to 9 to mark the year in the decade. Rolex sometimes has put the quarter or the month in Roman numerals, and the year in Arabic numerals on the case back. Omega placed the year of manufacture of a particular batch of cases immediately after the reference number in Speedmasters. For Doxa, the first two digits of the case serial number mark the year (only for watches made between 1940 and 1965). Sometimes, resources aren’t available or they don’t answer your questions. If that’s the case, you can contact the manufacturer although that’s usually expensive. Omega, Zenith, PP, and VC, for example, won’t tell you a thing, unless you order an extract from the archives. This will often cost you more than 100 USD. Fun fact: Patek Philippe won’t charge you anything if the movement number doesn’t match the case. You don’t have to pay for the bad news. Longines provides information about all their vintage pieces at no costs at all. Zenith and Omega used to work the same way but sadly, not anymore. When was the movement made, what case should it be in, model details, where was the watch invoiced, etc. Generally, they’ll provide all that they have in their archive for a specific watch. What if the records are gone? That happens if the brand no longer exists, or was “reactivated” after going bankrupt. Some brands were simply careless when it comes to keeping records. That’s where it gets harder. Often, the archives weren’t kept safe. Doxa’s archives were flooded somewhere around 1965. Cyma’s records were destroyed in a fire. With Doxa, it isn’t that bad, although for pre-1940 watches it can be a challenge. Unless you were lucky and bought a presentation watch with an inscription of a date. Not a difficult method, but it doesn’t always work. Were there late 1940s watches straight out of the 1930s, with fixed lugs and the general looks of a 1930s piece? Yes. 1940s style watches in the 1950s? Yes. 1940s/1950s style in the 1960s/1970s? Yes. Before the early 1950s, the majority of watches had no shock device. It became a standard feature around 1950-1952. The most popular one, Incabloc, was patented in the early 1930s. It wasn’t used on a larger scale though, except for WW2-era German military watches, where the specifications required a shock device. Shock-Resist was more common and used on a larger scale by Tissot among others. Yet, watch manufactures still made much more watches that didn’t have shock protection. For pieces made for the American and British markets, a shock device wasn’t a must even until the late 1950s. Sometimes a patent number on the watch helps a lot. You can easily look up patents on Espacenet. But the year of patenting a particular technical solution only tells you the earliest possible date a watch was made. It’s more useful when you’re trying to determine the manufacturer of a watch. Unsigned watches are very common, especially if we’re talking about pocket watches. So, it’s another method that can work, but there’s a ton of exceptions. In the early 1960s, the much safer tritium gradually replaced radium. Most Swiss companies phased out radium by ca.1962-1963. Dial markings pointing out the lume material are very telling. A “T” at the bottom of the dial implies tritium. This means, that a watch is definitely post-1960. Sometimes it’s only the cross, sometimes “brevet”, sometimes both. In this case, you can easily look up the patent registration date by looking up the patent itself in Espacenet. Sometimes there will be a number like a patent number but marked “Depose”. In this case, it’s a number of a registered design (not a patent), for which the records no longer exist. At least they aren’t available anymore. It also never hurts to check, if a number without markings indicating it as a patent isn’t actually a patent number. This will rarely produce a result, but after all, you want to investigate every lead. Note that a patent number gives you the earliest possible year of production. Let’s illustrate that with a case study. A patent for a watertight case was registered in 1955. A watch with that patent number is marked with a T for tritium on the dial. That rules out production earlier than 1960. So, with these 2 clues combined, you can date the watch to 1960. This only applies when all the other methods also point to the decade that a patent was registered in. Sometimes, some part of the watch – often the case – is marked with the word “Brevet” and the Swiss cross. But it doesn’t have any extra numbers. It tells you that a part is protected by a patent, but it doesn’t tell you who registered the patent and when. Every now and then, it’s a good idea to look for vintage watch adverts if you’ve matched the style of the watch with a decade. The date the ad was originally published is often mentioned. No, this might not be the year your watch was made, but it’ll be close. 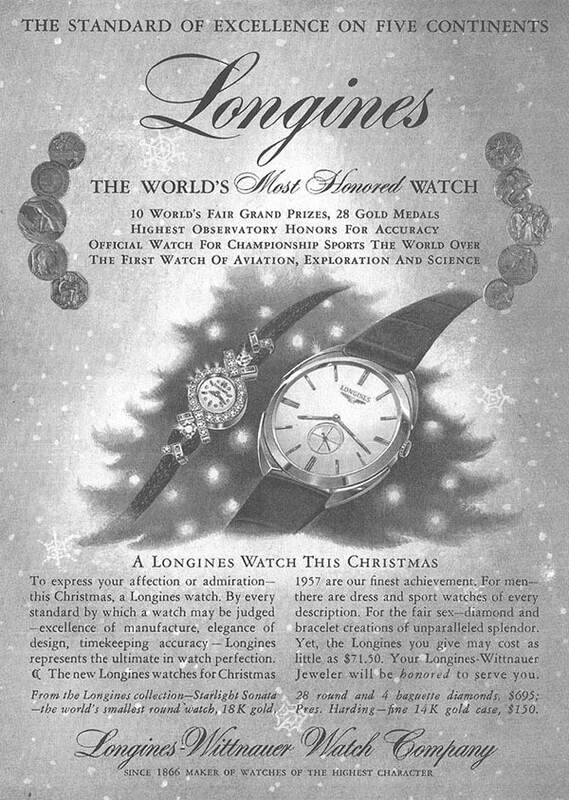 Vintage ads also show you the original strap your watch was sold with. It’s useful to know the production years of a particular movement. They can give you an idea of the period that the watch was made. However, that can be more than a decade. So, that’s not very accurate. This dating method can fail spectacularly. Especially if the manufacturer has used a batch of movements that was made a few years earlier. It works fine with gold, silver, and platinum British market pieces, cased locally. Each assay office had its particular style of the “date letters”. As long as you identify the assay office mark, you can easily look it up. The British hallmarks are well documented. While both terms have been used in the 1950s and throughout the 1960s, 1969 appears to be the date that “water-resistant” became the common phrase. The use of “waterproof” was eventually dropped because it’s impossible to 100% shield a watch from water at all times. A lot of inefficient designs couldn’t live up to that promise. The use of “water-resistant” or “water-resisting” was very uncommon before 1969, so you can assume that a watch marked “water-resistant” was made after 1969. You’ll only find this marking on pieces made for the American market. The use of radium lume was banned in the USA in 1969. In the early 1960s, some countries made it mandatory to mark the lume material on the dial. So, a watch with the “Ra SWISS Ra” marking will be later than ca.1960, but earlier than 1969. If a watch doesn’t offer any clues about its date of manufacture, and the lume markings aren’t there, you’ll need a Geiger counter. Some countries didn’t require marking of lume material on the dial. In case of these pieces, before you check the dial with a Geiger counter, you can’t know if it’s radium or tritium. Radium on a Swiss made watch places its production date before 1960-ca. 1963. In some cases, certain case materials were only popular for a certain period of time. For example “nickel chrome” cases were only popular in the 1930s, and until the early 1940s. Staybrite steel was mostly used from the early 1930s until the mid-1940s. However, some manufacturers still used it until the late 1960s. While it’s not unusual for a watch to have an engraving with the date that a watch was given to someone, this can often be misleading as a method of dating. First of all, the date of presentation doesn’t have to be the date of manufacture. A watch could have remained at the store for two or three years before someone bought it and had it engraved. Also, the date in an engraving isn’t always the date that the watch was presented to someone. It could have been a date of marriage or birth date of the receiver. For that matter, it could be any other important date to the giver and to the original owner of the watch. All in all, estimating when a watch was made isn’t difficult. Part of it is a basic evaluation of the design and technical features. Once you’re done with that, what’s left is digging in the resources. Of course, sometimes you’ll have to deal with the fact, that the nearest decade is as accurate as it gets. If the serial number of the watch can’t be matched to any resource, you have to use all the other methods. The more of them you use, the more accurate your evaluation will be. If you want your findings checked by more experienced collectors, the resident members of watch forums are usually willing to help. Keep in mind that you don’t make a good first impression if you haven’t done any investigation yourself. Always put as much effort into your own research as you can. All this detective work and exploration will help you to become an experienced watch collector. Walking Polish watch encyclopedia. Fond of Omega, Eterna and Tissot. Loves sailing and drinking good whisky. Not at the same time. Do You Need to Replace the Mainspring with Every Service? What Makes the Perfect Dive Watch? What’s the Deal with Tre and Sei Tacche? FAQ: Can I Safely Wear a Watch Found in a Drawer? FAQ: Why Are There Scratches on My Sapphire Crystal?